Come and enjoy an evening underwater with us! If you’ve seen pictures of the exciting, and colourful underwater world and wondered how to start exploring it, then your first step should be a Try Dive with us! Our qualified instructors will take you through the basics of using SCUBA diving equipment, give you a taste of what it feels like to breathe underwater and introduce you to the awesome experience of swimming in a weightless environment. All you will need on the night is your swimwear ( plus an old T-shirt ) and a towel; we provide the rest! You will need to be 14 years old or more to take part. If you are under 18, a parent or legal guardian must give their consent and must be present. 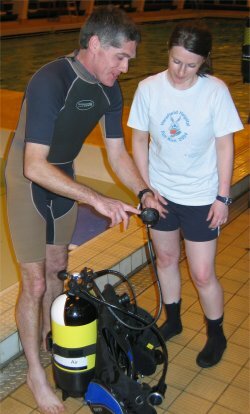 As there are some conditions that preclude taking part in SCUBA diving you will be asked to sign a medical declaration. If you have a condition you suspect may be an issue please Contact Us for advice before booking. Book your experience now via this link!